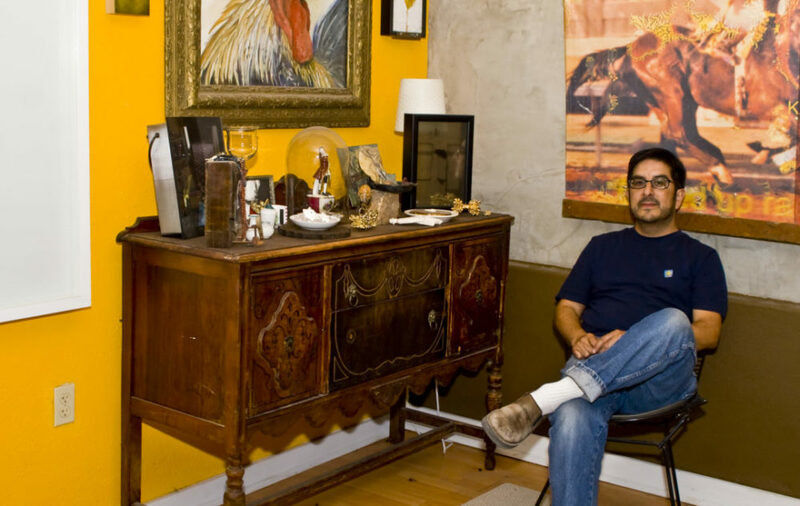 Andy Benavides is a home grown product of San Antonio and an active participant in local art scene. A graduate of Burbank High School, Andy attended college at San Antonio College and North Texas and entered into the field of advertising. Eventually, Andy would find his way back to San Antonio where he became the owner/operator of BZ Designs, Benavides Framing, and ONE9ZERO6 Gallery, all while continuing to work and create as an artist. Along with his wife, Yvette, Andy started the SMART organization five years ago. I got a chance to sit down with Andy, talk SMART, and the importance of art in our community. While operating Benavides Framing and ONE9ZERO6 Gallery, Andy Benavides saw an opportunity where he could collectively bring together artists, nonprofits, and patrons in a way where the sum was greater than the parts. This led to the idea of creating the nonprofit SMART, an organization to Support Multiple Art Resources Together. By using, “creative services and art educational events SMART is dedicated to raising awareness of the developmental impact of the arts on our city.” SMART promotes all types of art, ranging from visual to performing to culinary (and everything in between). Additionally, Benavides’ marketing acumen led him to search for a word that can be branded across industries and people much in the same way that the “green” label is being used today. “We could have SMART transportation, SMART foods, SMART businesses,” Benavides says, showing that those organizations support the arts throughout our city. By enveloping San Antonio with all the different flavors of art, Benavides firmly believes that this can inspire and unleash a wave of creativity that could have far reaching impacts to our city. Getting people interested in art, and even creating art themselves, helps develop the right side of the brain that is so crucial to creativity and emotions. In addition to supporting and calling attention to the local art scene, Benavides feels a huge need to inspire the next generation of artists and audience of San Antonio. He sees himself as a case study on how art can positively impact an individual’s life; this is one of the reasons he located the ONE9ZERO6 Gallery in the community he grew up in. Benavides wanted an opportunity for kids and adults to visit a gallery without intimidation, breaking that stuffy stereotype of traditional galleries. Local artist and entrepreneur Andy Benavides at his residence. Photograph by Andrea Campos. This led to the creation of the SMART Fair right in the backyard of Briscoe Elementary School. 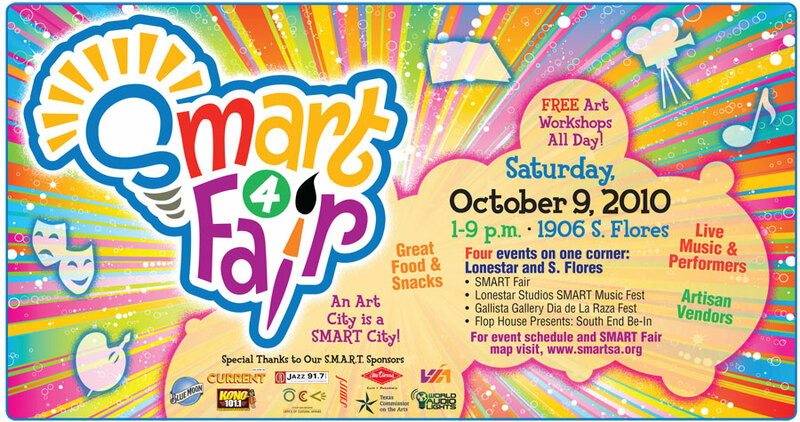 In the first SMART Fair four years ago, Benavides used a festival atmosphere (complete with corn on the cob, raspas, and music) to get people to show up to the festival and then surprised them with 15 events all dealing with art including flamenco dancing, responsive drawing, percussion, DJ spinning, and piñata making. Benavides sums up the idea by saying that, “I’ve lured people in to the site and I am going to overwhelm them with everything that’s art. They’ve come to the facility. They’re looking on the walls. They’re asking questions, seeing things they have never seen before. People are engaging in discussion about things they either like or dislike or could do better or worse. It’s funny because there’s just like this buzz [throughout the grounds].” This tradition has continued today with the 4th Annual SMART Fair happening Saturday, October 9 from 1:00-9:00PM. Benavides has high aspirations for what SMART can become, desiring for it to someday be the “United Way of Art.” He would like to showcase local artists and bring in others for a SMART month; already five hotels are on board with the idea. He even sees the potential for having SMART sister cities, where artists from around the world have a network to help get their voices heard. By creating a mechanism for art to blanket San Antonio, our city can truly tap into the creative energy that is just below the surface throughout our entire community. Inspiring people to create and converse can only produce positive results. Truly, an ART city is a SMART city. For breakfast or lunch, Andy prefers to visit Maria’s Cafe on 1105 Nogalitos and loves their soft chicken tacos with ranchero sauce. He advises that you would wash it all down with homemade limonada. A favorite dinner place for his family is Capparelli’s on Main on 2524 Main St; he highly recommends the chicken alfredo as his son, Agusto, really loves the noodles. To get through the day, Andy loves to snack on an English Muffin with peanut butter and strawberry jelly, bananas, or honey and an ice cold glass of milk.